We have just landed back from an amazing February 2018 NEC Caravan show! 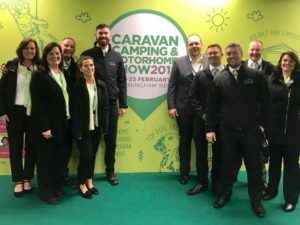 Birmingham NEC was again the host of this much anticipated event, with happy campers arriving in their tens of thousands. We (as always) were busy setting up both of our stands, to represent the Lunar & Swift Group dealership special editions that we are extremely proud to sell. The amazing show team! From left to right: Annette, Verity, Andy, Lauren, James | Paul, Graham, Terry, Tim & Sharon… Not forgetting those back at base, holding the fort whilst we were all away! Paul, Tim, Andy, Sharon & Annette made up the ‘Lunar’ team, this year. The Solaris & Clubman Solaris ranges (click to view) went down an absolute treat. With a record number of sales & a great reception to our best selling Lunar Caravans range, the Solaris really held itself up as a premium caravan range. Terry, James, Lauren, Verity & Graham were the ‘Swift’ team this year, displaying the impressive Siena & (all new) Elite ranges. 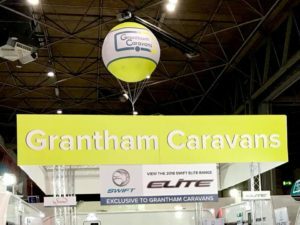 The Swift stand was a hit with customers and manufacturers, with its new and very bright Grantham Caravans gantry setup! It really was a hard one to miss when walking through the show! We have invested in 3 high quality helium blimp style balloons this year, to elevate (sorry!) the stands to the next level. It proved to be successful, with current and potential customers all using the balloon to find our stands in the vast sea of caravans at the impressively large NEC show. It took over 12 cubic metres of helium to inflate all three (yes, 3!) of our blimp style balloons. That is a LOT of squeaky voices if we left the valve open! 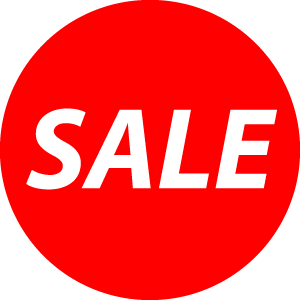 Swift Caravan Sales is a trading name of Grantham Caravans Ltd (GC), registered in the UK - company number 0300511.